For centuries, the raven Corvus Corax has stalked us in life and in death. Excavations of Bronze Age settlements in Britain have revealed raven bones mingled with human remains. The Viking and Norman warriors that stormed these shores did so sporting ravens on their shields and banners. By the 15th century the service the birds provided scavenging and picking clean bodies on the streets of British cities led to their protection, under the first-ever piece of nature conservation legislation. Yet by the 1700s this relationship between humans and the raven had soured. The birds came to be regarded as vermin – and representative of something deeper and more visceral – and were driven out of our towns and cities with a hatred that moved into savagery. 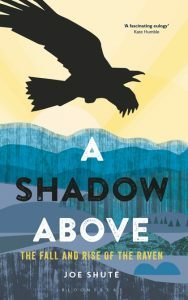 By the close of the 19th century, ravens clung on only in the furthest outposts of the country – the southwest, west Wales and the Scottish uplands – and this remained the case throughout most of the last century, but the past decade has witnessed a remarkable comeback. Raven numbers have increased by 134 per cent since the turn of the millennium and there are now well over 12,000 breeding pairs across the country, with these moving ever closer to human settlements. The history of this bird embodies our best and worst impulses, and symbolises our deepest fears. Ravens became ingrained in our culture as omens of death, and we projected our own deepest fears on to them. Joe Shute’s book chronicles the return of the raven, and the people who have made that comeback possible. In it, he travels to every corner of the country, meeting those who have spent the past ten years recording every sound and sighting, and showing why these birds reflect and provoke our innermost feelings. His interviews will range from the descendants of the Vikings on Orkney to those who monitor the White Cliffs of Dover, where ravens have started breeding for the first time since the Victorian era, to the burgeoning raven roosts of Anglesey. Joe meets biologists studying the vast intellect of the birds which have proved how they mimic human speech – and interactions – and the city dwellers who never imagined the sight of ravens in residential streets could ever be possible in their lifetimes. He also spends time with upland sheep farmers still struggling to come to terms with this uneasy relationship, and asks why we drove this bird to near extinction in the first place. Artist/Author: Birkhead, Tim, Jo Wimpenny and Bob Montgomerie. Provides an engaging and authoritative history of modern ornithology, describing the visionary and often-controversial personalities who have influenced the study of birds, and the unique social and scientific contexts in which these extraordinary individuals worked. This beautifully illustrated book opens in the middle of the nineteenth century when ornithology was a museum-based discipline focused almost exclusively on the anatomy, taxonomy, and classification of dead birds. It describes how in the early 1900s pioneering individuals such as Erwin Stresemann, Ernst Mayr, and Julian Huxley recognized the importance of studying live birds in the field, and how this shift thrust ornithology into the mainstream of the biological sciences. 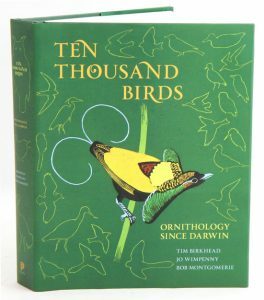 The book tells the stories of eccentrics like Colonel Richard Meinertzhagen, and describes the breathtaking insights and discoveries of ambitious and influential figures such as David Lack, Niko Tinbergen, Robert MacArthur, and others who through their studies of birds transformed entire fields of biology. This book brings this history vividly to life through the work and achievements of those who advanced the field. Drawing on a wealth of archival material and in-depth interviews, this fascinating book reveals how research on birds has contributed more to our understanding of animal biology than the study of just about any other group of organisms. Artist/Author: Burtt, Edward H., Jr. and William E. Davis, Jr. 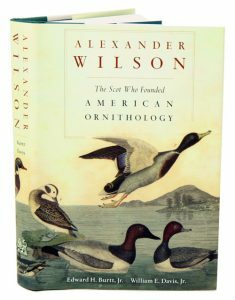 In the first full-length study to reproduce all of Wilson’s unpublished drawings for the nine-volume American Ornithology, Edward Burtt and William Davis illustrate Wilson’s pioneering and often underappreciated achievement as the first ornithologist to describe the birds of the North American wilderness. Wilson travelled 12,000 miles on foot, on horseback, in a rowboat, and by stage and ship, establishing a network of observers along the way. He wrote hundreds of accounts of indigenous birds, discovered many new species, and sketched the behaviour and ecology of each species he encountered. Drawing on their expertise in both science and art, Burtt and Davis show how Wilson defied eighteenth-century conventions of biological illustration by striving for realistic depiction of birds in their native habitats. He drew them in poses meant to facilitate identification, making his work the model for modern field guides and an inspiration for Audubon, Spencer Fullerton Baird, and other naturalists who followed. On the bicentennial of his death, this beautifully illustrated volume is a fitting tribute to Alexander Wilson and his unique contributions to ornithology, ecology, and the study of animal behaviour. 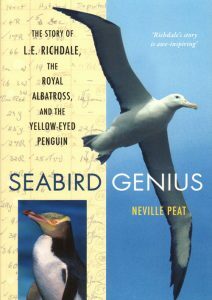 Seabird genius: the story of L.E. Richdale, the Royal albatross and the Yellow-eyed penguin. The first biography of Lance Richdale, who achieved international fame as the father of Otago’s albatross colony from 1936 and for his research on the behaviour of the Yellow-eyed Penguin. Richdale grew up in Wanganui, took a tertiary course in agriculture in New South Wales, and returned to New Zealand to teach mainly in rural schools in the North Island, eventually taking up a position with the Otago Education Board in 1928 as an inspiring itinerant agricultural instructor and nature study teacher. Richdale never gave up his day job and incredibly in the weekends, holidays and evenings undertook major, meticulous and time-consuming research on penguins, albatrosses and several petrel species. His study of the muttonbird was achieved during prolonged solo camps on tiny Whero Island in stormy Foveaux Strait, where the wind blew straight from Antarctica. Neville Peat’s biography searches the traces left behind to uncover what drove this shy and obsessed man whose legacy is the longest running seabird population study in the world. Roger Tory Peterson: a biography. Mildred Wyatt-Wold Series in Ornithology. A biography of one of the 20th century’s foremost ornithologists, whose 1934 “Field Guide to the Birds” was one of the two foundational books that launched the environmental movement. 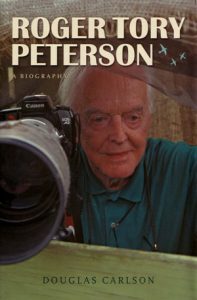 It describes how Peterson’s obsession with birds began in boyhood and continued throughout a multifaceted career as a painter, environmentalist and photographer. 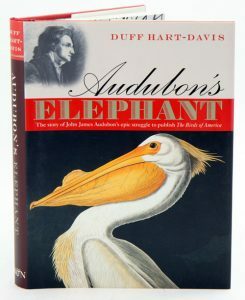 Audubon’s elephant: the story of John James Audubon’s epic struggle to publish The Birds of America. The author records the genesis and gestation of the double-elephant folio, and uses contemporary sources to illuminate an extraordinary character.